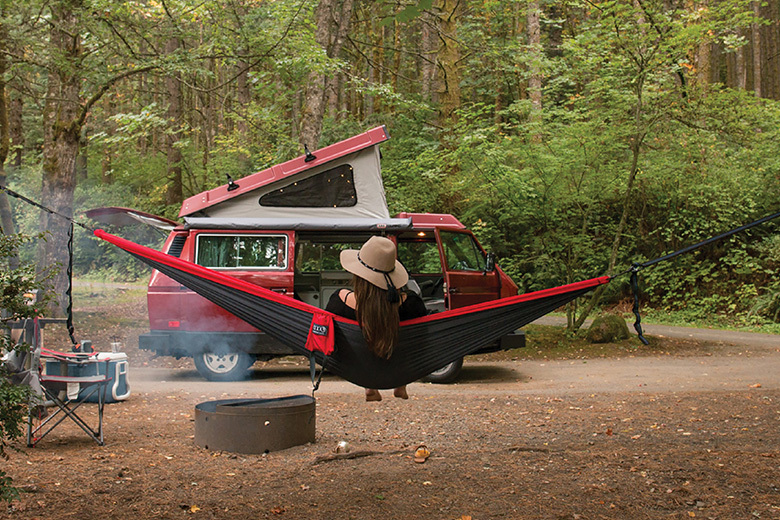 A Westfalia van is the road-trip-ready vehicle to launch an exploration of all things vintage. The counter bar at The Poodle Dog restaurant in Fife looks much like it did when it opened in 1933, and the menu is a nod to a time when restaurants were chosen for the size of their portions. It was the first stop on my road trip—an unabashed throw-back journey to discover vintage diners and roadside attractions between Seattle and Sequim. The trip was partly the result of my obsession with Volkswagen Westfalia camper vans. I’ve been a fan of this vehicle ever since I was a kid, but after camping in one for several days at the ocean last summer, I was once again hooked. As the perfect accompaniment for this trip, I rented a fully restored 1980s “Westy” from Peace Vans Rentals. It comes equipped with the quintessential pop-top bed, sink, stove, cooking utensils, camping gear and even a French press. Photograph by Amy Meredith. Campy charms at roadside diner Fat Smitty’s. After polishing off my “famous omelette” (so described on the Poodle Dog menu), I revved up the van and returned to the highway. I quickly discovered that if I wanted to have any fun, I needed to slow down. Westfalias aren’t known for their big engines (I wouldn’t be passing anyone on steep hills), but the forced slower pace was almost therapeutic. I chose a meandering route south and then north along the Kitsap Peninsula. Josephine’s Redeemed Boutique in Port Orchard was my next stop. The shop sits in a former dockside warehouse built in the early 1900s. When the tide is in, you can watch seals swim by as you shop. Visit the vintage kitchen for a collection of vinyl records, just behind the old luggage and antique cameras. Just as the sun was setting, I was nearing my final destination for the day, Sequim Bay, and decided to make one more stop: Fat Smitty’s, a classic roadside diner off U.S. Highway 101 near Port Townsend, for a fresh blackberry shake. With a fully stocked vehicle, I could have chosen to spend the night in the van—which even has curtains on the windows—at a campground, like the nearby Sequim Bay State Park. Photograph by John Gateley. You can get coffee at Bob’s Java Jive, built in 1927, but it’s better known for karaoke and live music. But sometimes a hot shower is what you need, so instead, I checked into a 1940s waterfront cabin, decorated with old photographs and antique marine supplies, at Sunset Marine Resort. And as I imagine the resort’s guests did back in the 1940s, I sunk into the porch hammock, with nothing to do but listen to the waves. I had finally slowed down. Peace Vans Rentals’ Westfalias will give your road trip a nostalgic vibe. Hit the road with these songs with a freewheeling spirit from another era.